Agriculture is the mainstay of the economy of many countries in the Asia-Pacific region as nearly 60 percent of its population derives livelihood from agriculture. The region has several hot spots of rural poverty, as most farmers in the region are smallholders with diverse farming systems, which are highly risk prone. In addition, these farmers have poor access to support services such as extension and the agricultural markets, knowledge, technology and financial credit. Obviously, a second “green” revolution is needed not only to produce more food in the region, but also to enable participation of its farmers more equitably in innovations and markets to reduce rural poverty, generate better rural livelihoods and maintain quality of life and environment. 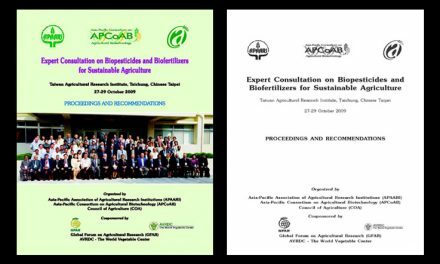 This second revolution could be termed as knowledge revolution and there are already some visible signs that Asia-Pacific rural agriculture is in midst of it. The new Information and Communication Technologies (ICT) are bringing about and sustaining this revolution by empowering the resource-poor farmers with up-dodate knowledge and information about agricultural technologies, best practices, markets, price trends, consumer preferences, sources of finance, weather, soil-moisture conditions and the environment. 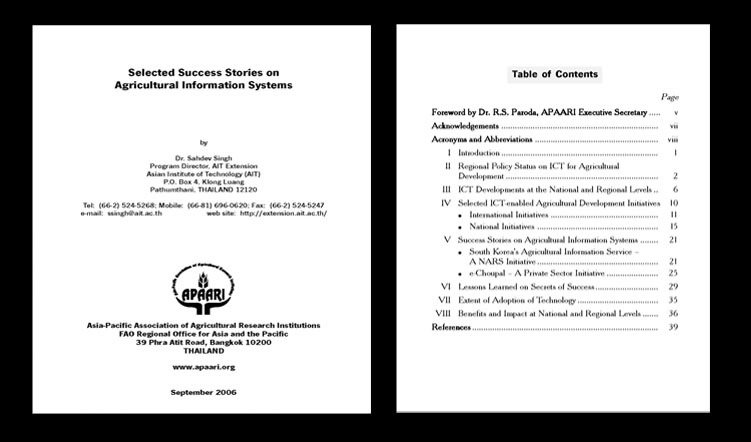 Building upon a previous report on status of ICT in ARD (APAARI, 2004), this publication reviews the current state of telecommunication policy for rural and agricultural development, diverse applications of new ICT in rural farming areas of selected Asia-Pacific countries and identifies different models of such applications by analyzing the context of local situations. It also assesses the potential impact of ICT in agricultural development by describing two successful cases – one from South Korea and the other from India – where the potential of ICT is harnessed for the benefit of small farmers. The South Korea case is a NARS initiative to provide agricultural information services using state-of-the-art ICT to more than 100,000 farmers and extension agents per month. While the Indian case is a 5-year old private sector intervention being scaled up to empower 10 million farming households by providing them access to up-to-date farming knowledge from experts and universities, and real-time information on markets, prices, weather, etc. Both the success stories have certain common elements such as the recognition of information and decisionmaking needs of farmers, capacity building support to farmers to enable them master the new ICT, and a user-friendly ICT-enabled agricultural information system.